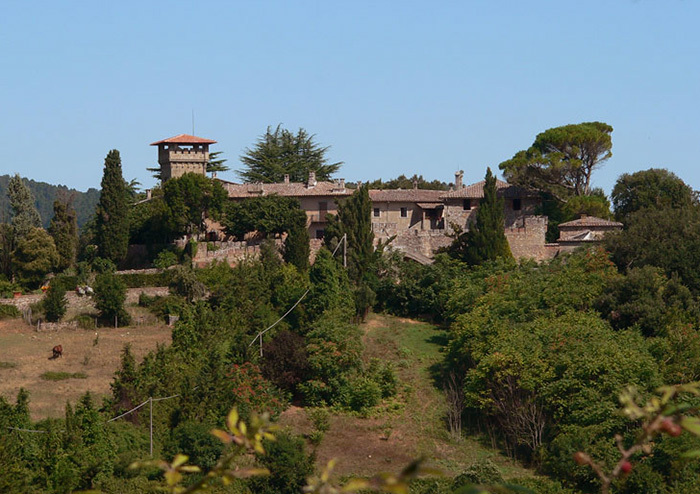 The territory of Roccastrada is surrounded by protected nature reserves, including La Pietra nature reserve. Torniella s situated in the heart of La Pietra and Farma nature reserves. The area stretches for 530 acres. The name of this reserve refers to the rocky spur and its 442 metres of elevation which dominates the course of the Farma River that runs far below. It was established in order to conserve the landscape’s precious value and safeguard its unique vegetation and geological formations. The woods of the reserve are truly breath-taking and its undergrowth in springtime is characterized by red lilies and cyclamen. They lovely flowers give touches of colour that are in harmony with the area’s primary green and various other tonalities. Rare wild cat live in this reserve in addition to birds of prey, such as a rare variety of falcon. In the month of May, it’s common to see solitary male deer as well as doe with their fawns nearby, usually hidden in the high grass. 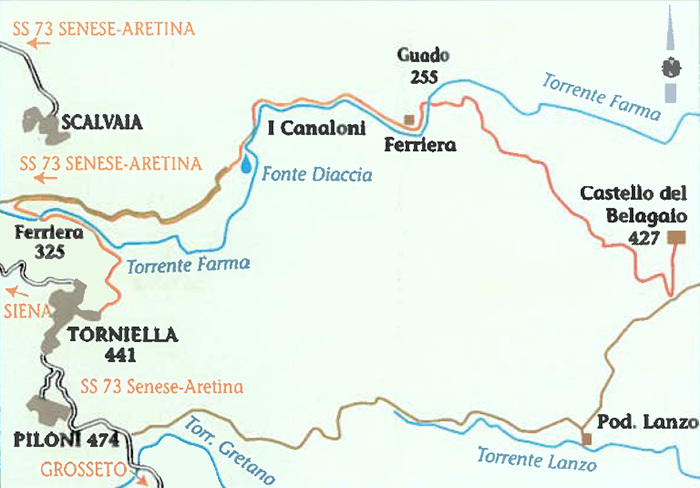 This is the "Ferriere" (iron foundries) itinerary. It is interesting for its botanical aspect: from the castle to the torrent Farma we find many species of trees such as the durmast, the lime and the maple. The "Poggio alle Macine" slope has a series of vertical bents where vegetation grows. The dominant species are: homl oak, arbutus, heather, going down to the small valleys we find durmasts, turkey oaks; poplar and ash trees along creeks. With regard to the avifauna nesting in the territory, here the pied woodpecker and the wallcreeper are present, along with the tawny owl, the little owl and probably also the long-eared owl. Easy trail, winding through woods fields and pastures and occasionally on cartways it can be practicable in every season. Possibility of bathing in the Farma river (remarkable are the Canaloni). Water can be fetched along the route. Just after having crossed the Farma, we find the ruins of the first iron foundry, we then walk near some fine poplars and then next to the dyke which was once a barrier for the water used for the foundry. Keep on walking along the torrent bank (which is on our left), we get to the "Canaloni", a place where the torrent has dug out some pools on the rocks: in summer we can have cooling baths and sunbathe on the stones or on tiny sandy beaches. Keep on walking for other 600 metres, where the path detours on the right on leaving the torrent, we get near two water springs and after having covered part of a gravel road we get to the other iron foundry’s dyke. (If we find it difficult to cross the dyke we can easily arrive in Torniella covering all the gravel road as far as the no 73 road, Senese-Aretina).We carry on, walking through very pleasant fields, particularly beautiful in spring with various kind of wild orchids in blossom. After a while we can see the second iron foundry: it is a stone building, recently restored. We then walk under a chestnut tree wood to find a very peculiar engraved fountain with a stone chair by its side and we arrive in Torniella. 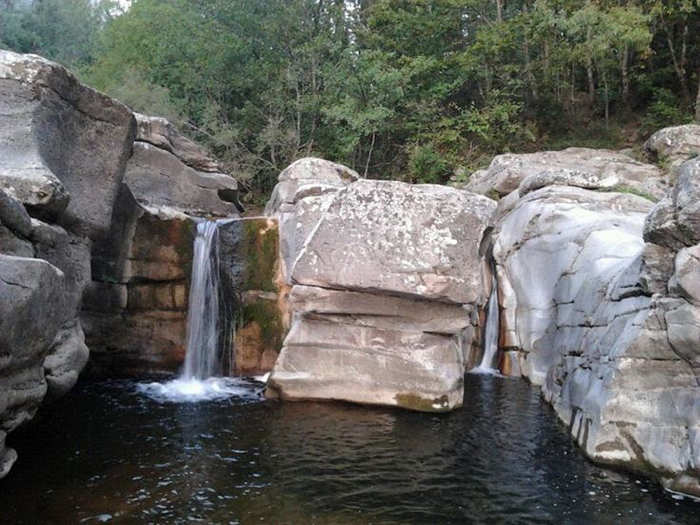 The Nature Reserve of the Farma, situated between Monticiano and Roccastrada, includes the beautiful, wild valley which hosts the Farma torrent—the Merse River’s main tributary. The reserve’s steep hills are covered with vegetation and enriched by the presence of many animal species, some of which are rare and only found in this area. The reserve boasts naturalistic qualities that are unique in the Province of Siena; they are considered amongst the most interesting in Italy. The Farma torrent is well-known for the pureness of its high quality water. In fact, it hosts myriad marine animals that simply cannot live in polluted waters. When you enter the reserve, you have the sensation of walking along a natural, primitive path. The Farma will welcome you with its fresh, clear waters and you can swim in the steaming water of the Petriolo thermal springs—a unique thermal pool with antique fortifications. Later, you can walk along trails hidden by rich vegetation, and let yourself be truly embraced by natural beauty. 'Roccastrada's ground is rich in copper, silver and gold" (O. Piattelli, 1902), this is the way the economic potentialities of the local mining were explained in a brochure where hopes and illusions were translated in words by renowned geologists of Regio Campo delle Miniere, above all a geologist named Lotti. The interest that our mines stirred up started long ago but it was less compared to Massa Marittima and Montieri. Near Roccastrada we can find ancient mine excavations attributed to the Etruscans. After centuries of inactivity, with the advent of the modem mining industry, at the end of the eighteenth century started in Maritime Tuscany intensive research and extraction with good results in Montecatini Val di Cecina, Larderello, Massa Marittima, Monte Amiata. Roccastrada's territory was part of it and in 1834 the "Compagnia Porto" was funded, a society that had the "concession of the perpetual rights of the excavation of mineral and metal of all sorts" (notarial act, 1834). This interest was concentrated on Roccatederighi's area and the copper of "between serpentine e diabase". The mine called "Cerrone e Costa" was dug out for many years. An unknown author wrote that the percentage of copper in the rock was of 2-4%. Digging stopped in 1880 as it was found that mineral was discontinuous and its consistency modest in spite of what the geologists had said. Brown coal had been excavated for centuries in the valley of Bruna and all the mining were a spur for the geological studies of this part of Tuscany. Chalk and siliceous sand farms have been recently opened. Siliceous sand was first excavated in Bono Staiale, it originates from the erosion and accumulation of 'VERRUCANO" sandstone in the Pliopleistocenic Age (1.8 million of years). Chalk is excavated from a pit in the torrent Bai valley end it originates from evaporation cf the superior trias, it can also be found around Sassofortino it originates from a clayeygypsum sedimentation in the Messiniano (10 million of years).